NEW YORK — In 1991, Sue Ismiel whipped up her first batch of Nad’s in her kitchen as a mother determined to find a gentle hair removal solution for her young daughter. In doing so, she created the original Nad’s Hair Removal Gel, which changed everything. Nad’s, which Ismiel named after one of her daughters, Nadine, arrived in the U.S. in 1998 to immediate success. The brand’s philosophy is to provide high-quality products, while being conscious of the environment, avoiding harsh and unnecessary chemicals, and remaining cruelty free across Nad’s entire product range. Today, Nad’s has grown to a global empire, though still a family-owned business, with Ismiel still working with her three daughters to solve the problem of unwanted hair for women and men around the world. 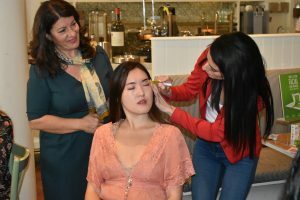 Ismiel and her daughter Natalie hosted the unveiling of several new Nad’s products at La Pecora Bianca in Manhattan on Wednesday, set to launch in December, including Nad’s Natural Sugar Wax, a natural way to achieve silky smooth, hair-free skin. The wax is made entirely with natural ingredients. “You can even eat it,” says Ismiel, adding that the wax will not damage or burn the skin. For Ismiel, natural ingredients are essential not only because they are healthier for the skin but also for the planet. “We care about your skin, but we also care about the environment,” she says. Nad’s All Natural Sugar Wax Kit, with a manufacturer’s suggested retail price (MSRP) of $12.99, available at Amazon, provides top-to-toe hair removal, with everything in one box. “Due to the rising interest and demand for all-natural beauty and skin care products, our Sugar Wax aims to reach a growing demographic that’s looking for effective, gentle and long-lasting results to their hair removal problems,” says Nad’s brand. “Our natural formula is unique in that it’s a no-heat sugar wax that melts with the body’s temperature, is gentle enough for all skin types, and is the natural way to silky smooth, hair-free skin that lasts up to eight weeks.” The wax, Nad’s adds, can also be used on all body areas, including legs, arms, bikini and face, and it is also mistake-proof, meaning the sugar wax can easily wash away with water if a mistake is made during the application process. Nad’s Body Wax Strips, MSRP $6.99 for 20-count or $8.99 for 24-count, available at drug stores nationwide, makes last-minute touch-ups a breeze. The specially crafted natural beeswax formula effectively removes hair gently and molds to all curves, making it easy to reach tricky areas. The strips are great for travel and suitable for legs, arms, underarms and the bikini area. Hair removal aftercare is something that is often overlooked in a beauty regimen but remains one of the most important and final steps in ensuring long-lasting and silky smooth results post treatment, according to Nad’s. Most women identify themselves as having sensitive skin, according to Nad’s. Chemicals in everyday products and exposure to elements can sometimes leave someone with sensitive skin red and irritated, especially during hair removal. Nad’s Sensitive Body Wax Strips provide a gentle hair removal solution that has been specially formulated with natural beeswax and infused with soothing honey and chamomile extracts to adhere to unwanted hair and remove it from the root, while also leaving the skin feeling soothed, smooth and hair free for up to eight weeks. The strips can be used on the entire body, including arms, legs and even delicate bikini areas, making it the go-to hair removal solution for sensitive and delicate skin types. Nad’s Sensitive Body Wax Strips 28-count, MSRP $8.99, is available online at Amazon. Following the success of Nad’s Original Hair Removal Gel Kit comes Nad’s Precision Eyebrow Wax Wand, a kit that includes everything needed for perfectly shaped, salon-quality brows at home, without the salon price. Primed with the same no-heat wax formula as the Original Gel, this precision wax wand is a true innovator in the DIY beauty category, according to Nad’s, by providing a solution to shaping, grooming and styling perfect salon-quality eyebrows right at home. The unique SlimTip precision applicator applies the exact amount of wax on the desired area to shape and define perfectly arched brows. Staying true to the popular eyebrow shaping trend, this product is available at a fraction of the cost when compared to salon waxes, yet it yields the same professional results. The applicator is perfect for other delicate facial areas, including upper lip and chin, with results that last up to eight weeks. Nad’s Precision Eyebrow Wax Wand is available online at Amazon, Ulta, Walmart, Target and other mass market retailers and pharmacies nationwide, MSRP $8.99.